With tonnes and tonnes of smartphones out there, I’m pretty sure you’ll be confused which one you should pick. If you are an iPhone fan, then probably you have very limited choices, you’ll either pick iPhone 5s, iPhone 6 or 6 Plus. But when you jump into Android segment, you have plenty of smartphones you can’t even remember their names. Samsung has a bunch of smartphones, Sony has a bunch of smartphones, almost all the popular brands have 2-3 good smartphone devices. If you want to buy an expensive flagship device, then it is pretty easy, you can easily choose Samsung Galaxy S6 or Sony Xperia Z3+ or anything like that. But what if your requirement is limited and restricted to only few major features. Like you need a smartphone only for taking photographs, or only for active Social Media use, etc., now, when you are confused like this, Google comes with an useful online tool to help you out. 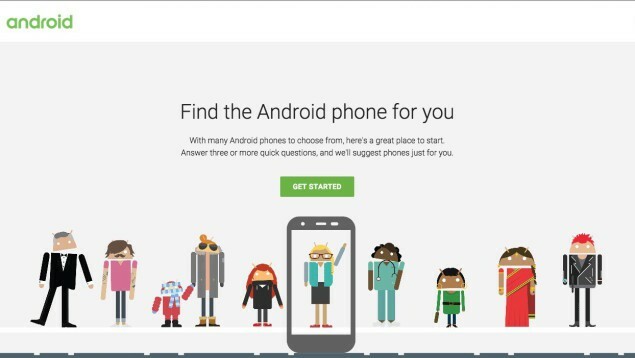 Yes, you can now use Google to find the right Android smartphone for you. Just answer their questions and at the end, you might see your required (or desired) smartphone(s). 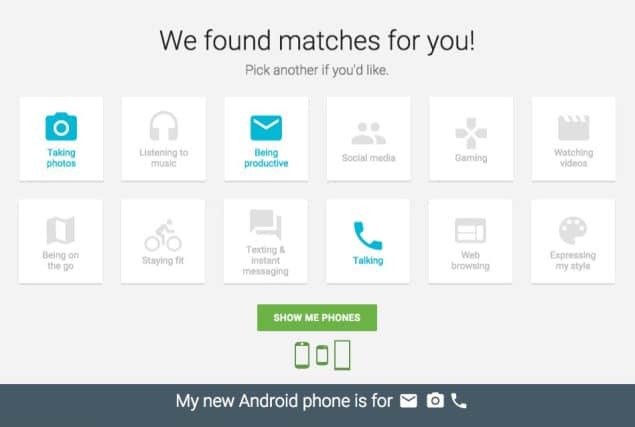 Google launched an online tool called “Android – Which Phone“, where they’ll suggest you the right smartphone(s) according to your requirements. Click the “GET STARTED” button and you’ll come across three or more questions according to the options you choose. This (below) will be the next screen, now this is the most important part, for what you use your smartphone majorly? Is it for taking pictures, social media use, or gaming, or blah blah? Tada! I got LG G4 (Capture the big picture), Motorola Droid Turbo (Clearer connection) and Nexus 6 (Ideal for entertainment). Seems fair enough. I’m pretty sure Google will try their best to include Nexus 6 and other Stock Android phones in this list, but as long as they are matching my requirements, I don’t really mind that. 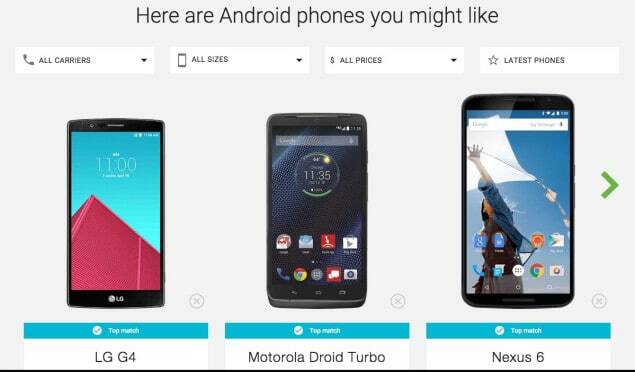 This is really a helpful tool for people are *very* confused about picking their right Android smartphone. Did you try this tool? Which smartphone(s) did you get? Do share your views in the comments below, or if you are facing any issues, kindly let us know and we’ll guide you right away. Google Android M Codenamed As Macadamia Nut Cookie?